It was fascinating making sense of the results from the survey, Employers Seeking Employees, because I was able to get valuable insights from human resource professionals who conduct employment evaluations; something I think can be improved upon with a professional website. I say this because of the following conclusions I was able to make based on the results of the survey. First, the respondents are using various web services (primarily MonsterJobs, CareerBuilder, and LinkedIn) when trying to find candidates, so it makes sense to link to your professional website in each of their profiles/resumes – create an identity. Second, a resounding majority of the respondents are willing to review other media than a traditional resume and cover letter and a professional website allows for you share all of these types of media – video resume, portfolio, publications, coursework files, and a blog. Third, a majority of the respondents (77.2%) agreed that a searching on a skill set is an effective way to find a candidate; the development of a skill set is one key component in the framework of a professional website. Fourth, the most important factor in getting employed is following the traditional method of “finding and applying to job listings” according to the survey results; the administrative interface of a professional website has many tools to support this method, including: creating PDF resumes and cover letters; managing contacts and applications; and delivering an application or sending an invitation to your website in an email. Finally, in open-ended responses, many of the respondents suggested having accurate and error-free content and to use industry specific keywords and skills in material presented to them; through GroupShare, a professional website has tools for peer-reviews and counseling to address these suggestions. Most respondents, 77.17%, are willing to review a professional website and in the early evaluation stages. This makes sense considering professional websites may eventually replace resumes as the standard platform for employment evaluations. A professional website has added functionality, richer content, and communication features built into it – why it can be referred to as a multi-dimensional resume. Not surprising, many respondents, 43.48%, are willing to review a video resume during the initial screening stage. Video resumes enable professionals to bring ingenuity to the application process. Candidates must create a script, plan a setting, choreograph a story, and show some personality while creating a video. Many respondents, 35.87%, are willing to read a blog during the initial screening stage. This confirms the importance in demonstrating you have something to say, and business and communications professors are onto something when they tell their students to start writing a blog. Most respondents are willing to review a “body of work” (publications, coursework, publications) during the initial screening or mid-review stages. Potential employers like to see work samples to make their own validation of a candidate’s capabilities. Social media engagement is clearly something HR professionals are reviewing in an evaluation; there is strong possibility how you represent yourself in Twitter, LinkedIn, and Facebook might be reviewed in a professional context. By far, these various forms of media are evaluated in the early stage of an evaluation and less so when a final decision is being made. All of these forms of media can be presented on a professional website. One of the objectives of the survey, Employers Seeking Employees, was to understand whether hiring professionals actively use web services to search for candidates, a requirement for an effective pull approach; where you “pull” a potential employer to your professional website. I think this tendency is becoming more common, especially with certain types of careers. And in open-ended responses, some respondents made it clear they do seek out candidates (see quotes below). However, applying to job listings through job boards, company websites, industry specific websites, and newspapers ranked by far the most important factor in finding employment according to the respondents. In addition, as I created the survey, I had an assumption that there was a significant increase in the pace of job placement (the time it takes to find and evaluate candidates, and make an offer) for two reasons: the availability of sophisticated web services employers can use to actively seek out candidates; and the necessity to hire quickly in our expanding service industry, especially in IT, business, and communications areas. I did not get as strong of a response as I expected. On a ranking scale 1 to 5 (5 being a major increase), the average ranking was 2.64 and the largest segment of respondents (38.5%) reported only “somewhat” and in open-ended responses expressed that an evaluation of “soft-skills” remains important. I designed a survey to get a better understanding about the tendency and circumstance of employers seeking employees by targeting them in web services – a key ingredient for the effectiveness of a pull approach; where you “pull” a potential employer to your professional website. For a pilot study, I distributed the survey anonymously to 92 human resource professionals. I wrote a five blog series: a general overview of the pilot study (this blog), a short analysis on web services being used, whether hiring professionals actively search for candidates, the media respondents are willing to use in their evaluation, and how a professional website can be used in the process. The answer to the question – are employers seeking employees by targeting them in web services – is sometimes and it is becoming more common, though the traditional methods of finding employment remain most important. The respondents are predominately using LinkedIn, MonsterJobs, Career Builder, and Google and 39.1% of them thought the effectiveness of these web services was only average. All of the respondents are willing to review various types of media while evaluating a potential candidate; the most commonly accepted media includes a professional website, video resume, portfolio, publications, and coursework. Most of the respondents, 77.2%, agreed that searching on a skill set is an effective way to find a candidate. One suggestion was to have more uniformity with the presentation of a skill set, so there is little variation with the same basic skill (i.e. website development and website design). From the open-ended responses, the general theme is searching on a skill set is the most effective starting point in finding candidates for employment. The traditional approach, finding and applying to job listings, ranked as the most important factor in getting employed. Social media engagement and professional networking was slightly higher than personal branding, of course there is some overlap between the two. Writing a blog was the lowest ranked factor; though, 12 of the respondents gave “writing a blog” a first or second ranking. Here is some information about my sample. 92.4% of the respondents are over 30 years old and the largest segment (41.9%) is between 45-60; the yardstick set by LinkedIn is 42 years old (the average age of a LinkedIn user). In suggesting a framework you might actually follow, it is must be accessible, actionable, not too tedious, and hopefully enjoyable; otherwise, you might read and understand the concepts but never do it. The skills based approach I have been discussing has these characteristics. There are many books you read that guide you through a methodology and provide a table where you are supposed to pencil in your ideas; personally, I cannot think of a time I actually filled out the table in a book and sometimes I have developed my own interpretation in an Excel spreadsheet. The integration of the skills based approach with a professional website allows for you to completely manage your skill set from within its administrative interface, so it is easily accessible in an intuitive interface. This integration includes a database driven table where you manage your skills, drag and drop interface to link them with your experiences, and a page where you can review your plans to obtain expertise with your skill set. Sometimes you are presented with a framework that makes a lot of sense, however it is unclear how you can use it in your everyday life. The skills-based approach lays out a sequential path in developing a skill set and suggests specific, concrete actions at each stage. You can learn more about these actions by reviewing this infographic. When you introduce something new to your life, you do not want to add something that is time-consuming and annoying – more clutter. Filling out long forms and/or paperwork can be bothersome to anyone. Managing your skill set is easy to do with a professional website. Some of the suggested actions, such as taking a personality test, might seem tedious to you; though you can always find other ways to get the same results. The general premise of planning and tracking the development of no more than 15 skills in your skill set should not be overbearing, however. Thinking about what you want to accomplish in your career can be enlightening and exciting, planning exactly what you to commit to and the contribution you leave behind is very inspiring. The development of a skill set suggests a framework to help you formulate a plan to reach your career aspirations, so it should be an enjoyable experience for you. Developing a skill set throughout a career should be the goal of every professional and can be accomplished in four stages: planning, building, presenting, and validating. This infographic shows what should be done at each stage. 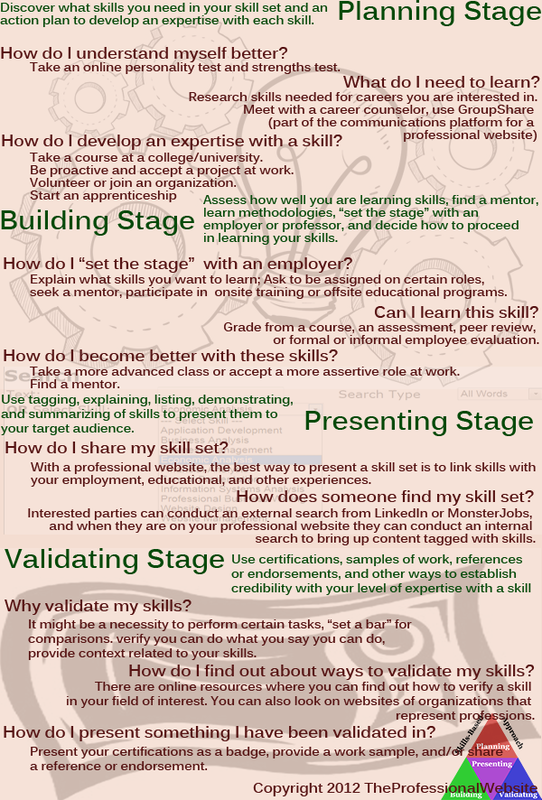 A professional website has features to support this skill based approach at each stage. You can read more about this integration by following some of the previous blogs click here (scroll down to view previous blogs).